Fig. 3. MET inhibition with CHIP overexpression in NCI-H69 lung cancer cells: the induction of apoptosis in vitro and inactivation of Akt and ERK signaling. 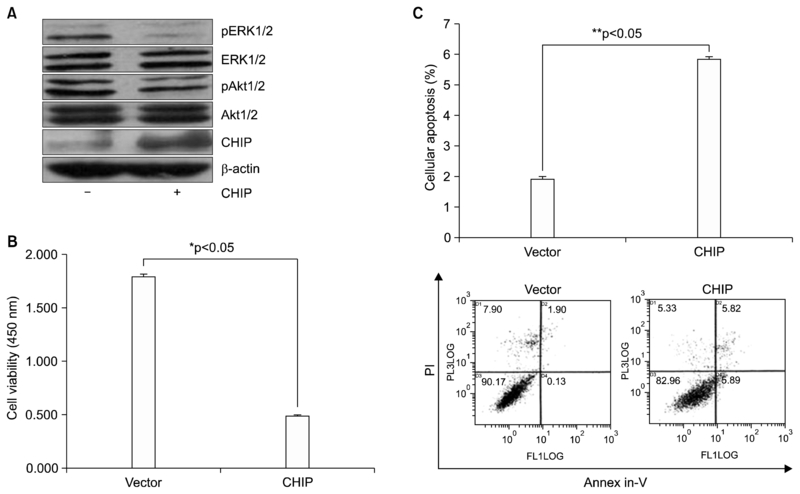 (A) Cell lysates were immunoblotted using the indicated antibodies (pAkt1/2, Akt1/2, pERK1/2, ERK1/2, and CHIP; β-actin was used as a loading control). ‘−’=pcDNA3 vector, ‘+’=pcDNA3-CHIP. (B) Following transfection with a pcDNA3 vector and pcDNA3-CHIP, cell viability was evaluated by a CCK-8 assay. (C) The effects of CHIP were examined by flow cytometry using an annexin-V/PI cellular apoptosis assay. MET inhibition by CHIP induced significant cellular apoptosis in NCI-H69 cells (5.83%±0.066%, **p<0.001) compared with the vector control (1.93%±0.06%). The bar graph shows the mean values of the percentage of cells in early apoptosis (annexin-V +/PI +) from 3 independent experiments for each treatment condition. MET, mesenchymal-epithelial transition factor; CHIP, C-terminus of Hsp70-interacting protein; Akt, protein kinase B; ERK, extracellular signal-regulated kinase; CCK-8, Cell Counting Kit-8; PI, propidium iodide.